Step-by-step guides to planning a long-distance walking through the picturesque villages and stunning landscapes of rural France. 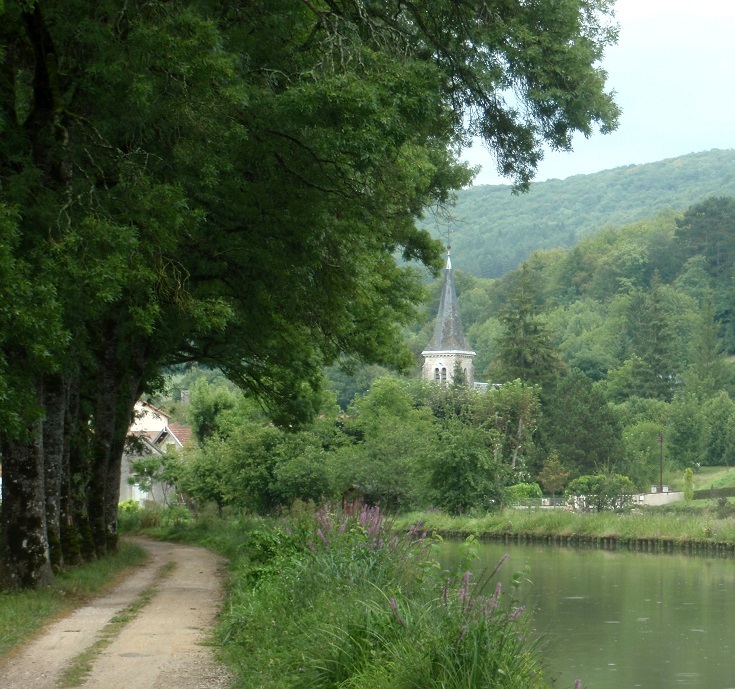 Two hundred and forty kilometres (150 miles) of flat, easy walking, rural scenery, small villages, historical splendour—it’s hard to find a good reason not to walk along the Burgundy Canal! Within easy walking distance or a shuttle bus ride from the canal, you’ll find seven châteaux, eleven churches, one abbey, three of France’s ‘most beautiful villages’ and forty other points of interest, such as canal bridges, museums, old buildings and of course, the canal tunnel. Although most of these distractions are located along the western side between Migennes and Pouilly-en-Auxois, the eastern side continuing on to Saint-Jean-de-Losne does, I think, have more than its fair share of beautiful lock houses (maisons d’éclusier en français) and stunning scenery. For the first forty-odd kilometres (thirty miles) after leaving Migennes, the canal is straight with only a few twists and turns to provide any sense of mystery. If you can ride a bike (which I can’t), then cycling this section will free up some time for exploring Saint-Florentin and Tonnerre. 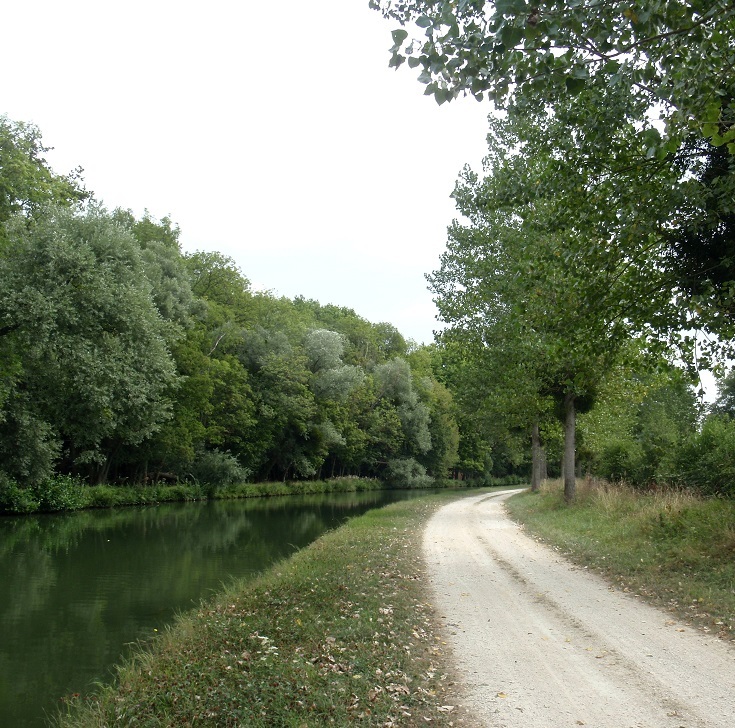 From Tonnerre to Dijon, the canal more closely resembles the meandering path you may have imagined it to be and when there is no boat traffic to distract you, it is easy to imagine horses plodding along the same tow path hundreds of years ago, pulling a barge behind them. As you walk you’ll see glimpses of centuries-old church steeples through the trees, carpets of wildflowers growing down towards the water’s edge, and, in summer, you’ll walk along lanes and roads flanked with fields of bright sunflowers. The path from Dijon to Saint-Jean-de-Losne is open and exposed for most of the way, with little shelter from the French summer sun. The engineers who designed this path appear to have drawn a straight line on the map and carved the shortest possible route between the two towns. This section is well-suited to cycling. I recommend renting one in Dijon and treating yourself to a leisurely cycle to the end of the canal. 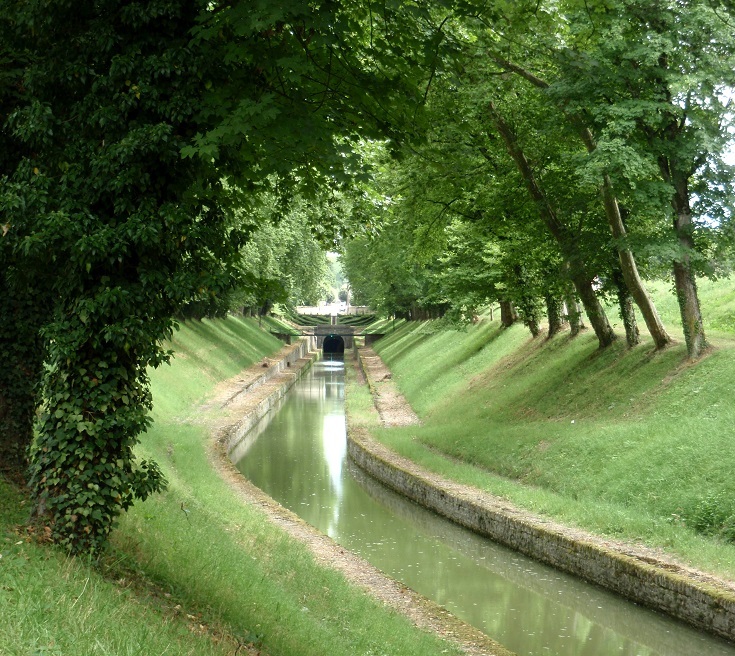 The idea of a canal through Burgundy was first raised in the early sixteenth century, when plans were drawn up to connect Dijon to the River Saône at Saint-Jean-de-Losne—a distance of just over thirty kilometres (18.8 miles). Work was scheduled to start in 1530 but the Wars of Religion brought the project to a halt. In the early seventeenth century, a much grander plan was proposed by Hugh Bradley, a Dutch engineer, to create a navigable path from the north of France all the way to the south by building canals to connect the Seine, Loire, Saône and Rhône rivers. The Dukes of Burgundy, who ruled from Dijon, were not in favour of this proposal. Under the original plan, the shorter canal ended in Dijon and ensured the city’s role as a major commercial port. Under the new plan, Dijon would become one town of many along the canal and its importance as a commercial centre would be greatly reduced. In 1676, the new plan was shown to Pierre-Paul Riquet, designer and chief engineer of the Canal du Midi. He declared it unfeasible. In 1727, Joseph Abeille revisited Hugh Bradley’s plan and proposed a route that connected the River Yonne to the Saône, roughly following the paths of the unnavigable Armançon, Brenne and Ouche Rivers. This is the path that the Canal de Bourgogne takes today. 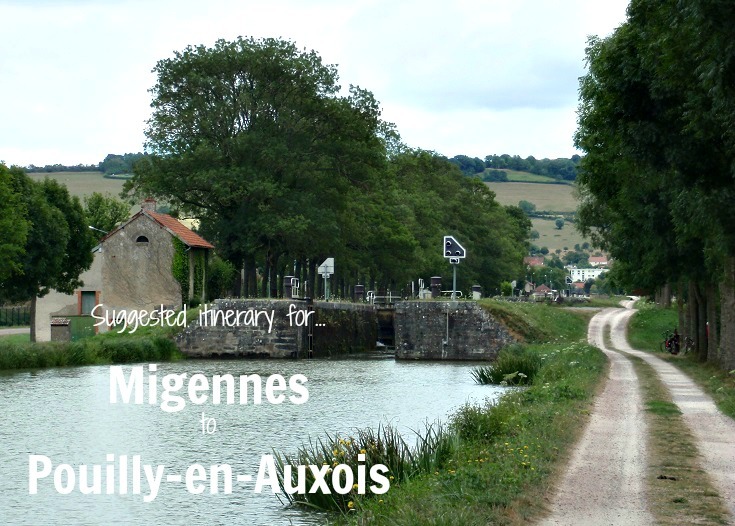 Another fifty years passed before King Louis XV gave approval for work to begin and agreed to fund construction between Migennes (on the River Yonne) and Pouilly-en-Auxois—the highest point along the canal. 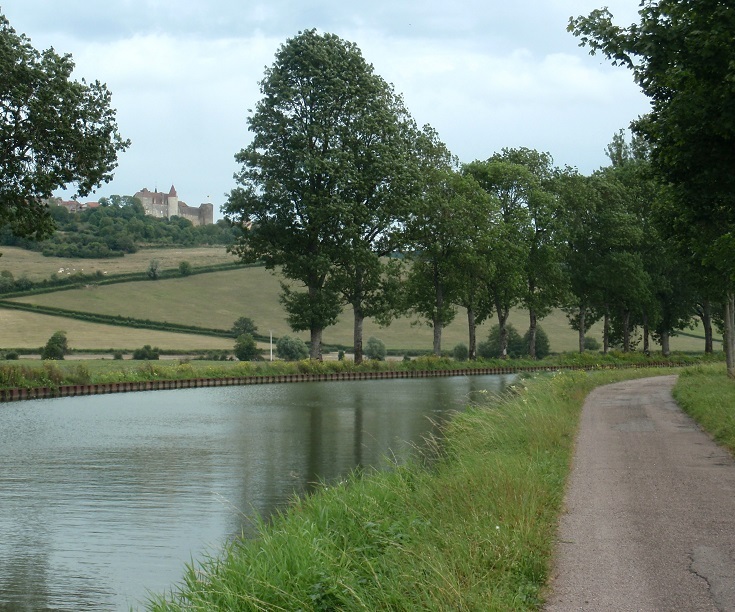 Construction of the canal from Pouilly-en-Auxois to Saint-Jean-de-Losne would be funded by the Dukes of Burgundy. Work on the Yonne side began in 1775, and on the Saône side in 1781, and continued until 1793 when the French Revolution brought all work to a halt. Construction resumed in 1807 under the orders of Napoléon and in 1808 the first vessel arrived in Dijon from Saint-Jean-de-Losne. By 1814, the canal was open as far as Pont-de-Pany. It was not until 1832—another eighteen years later—that the canal was opened to traffic along the entire route. 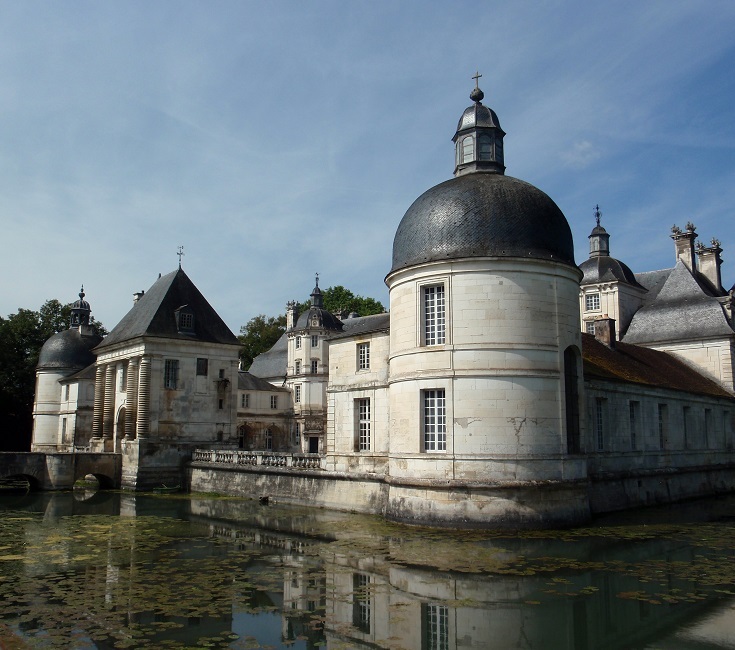 Within easy walking distance or a shuttle bus ride from the canal, you’ll find seven châteaux, eleven churches, one abbey and three of France’s ‘most beautiful villages’. In my suggested itinerary, I recommend spending an extra night in Tonnerre and Montbard and visiting as many of these attractions as you can. 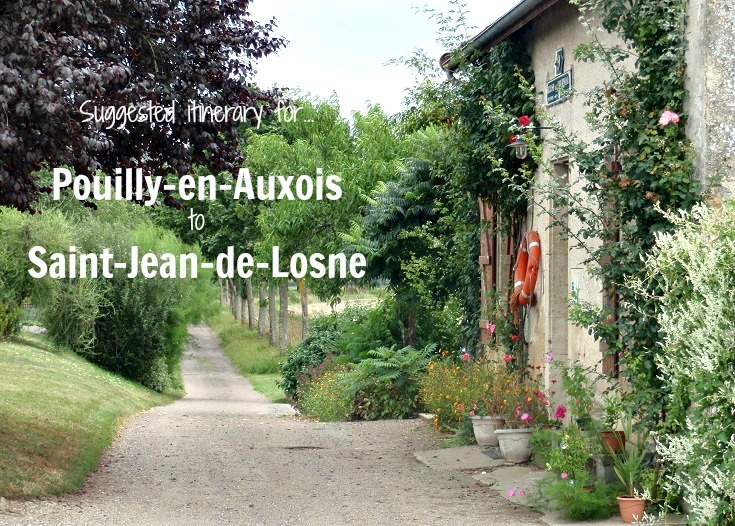 From Tonnerre, it is possible to visit Chàteau de Maulnes and the ‘most beautiful village’ of Noyers-sur-Serein on the tourist shuttle which operates several times a day, from Wednesday through Sunday in the summer months. A little further along the canal, you’ll reach Château de Tanlay, Château d’Ancy-le-Franc and Château de Nuits. All three are worthy of the short detour away from the canal and an hour or two spent exploring. From Montbard, a tourist shuttle follows a loop which stops at Château de Bussy-Rabutin, Abbaye de Fontenay and the ‘most beautiful village’ of Flavigny-sur-Ozerain. Between Pont-Royal and Pouilly-en-Auxois, the canal passes Château d’Éguilly (guided visits are available but must be booked 48 hours in advance). As you approach Écluse 8 S Vandenesse (two hours walk past Pouilly-en-Auxois), you’ll the see the high stone walls and turrets of Châteauneuf-en-Auxois—the third of the ‘most beautiful villages’—perched high on a distant hill. Don’t try to ignore it, surrender and head up the hill—you’ll be glad you did! At Pouilly-en-Auxois, the Burgundy Canal reaches its highest point. Rather than use locks to gain the necessary altitude, a 3.3 kilometre (two-mile) long tunnel was built 34 metres beneath the surface of the mountain. Thirty-two air vents were built along the route to provide air to the Spanish and English prisoners working within the tunnel and to allow the removal of dirt from multiple points. This enabled work to be completed in six years instead of the estimated fifty years it would have taken, working only from the two end points. Twelve of the air vents remain and can be seen if you walk the path from above the tunnel. With no room for the horses that towed the barges, the first boatmen had to manually pull their craft through the tunnel on a cable—a back-breaking trip usually taking ten hours. Thirty years later, a steam tug hauled each barge through, but by the end of the nineteenth century, an electric tug—powered by hydro-turbines and attached to a chain—was able to pull five fully loaded barges through at a time. Today, of course, the boats are motorised and the journey is much easier. There is still only room for one-way traffic through the tunnel and boom gates at each entrance control the flow of traffic, with six-hour windows in each direction. If you are not travelling by boat, the only way to experience the tunnel is to take one of the cruises that leave from the port in Pouilly-en-Auxois. 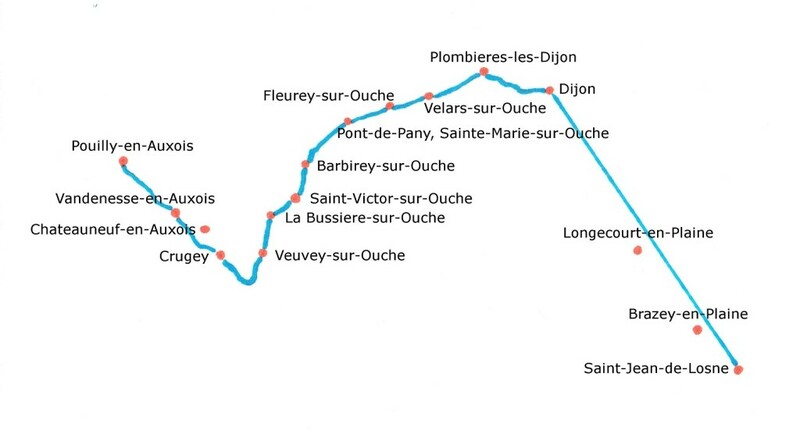 The two-hour cruise travels to the first lock on the other side of the tunnel before returning to Pouilly-en-Auxois. The full-day cruise passes through eight locks on the way to Vandenesse-en-Auxois where it stops for lunch (lunch is not included in the fare). No visit to Burgundy is complete without a day or two spent exploring Dijon—a beautiful city famous for its distinctive red, yellow and green patterned roofs. 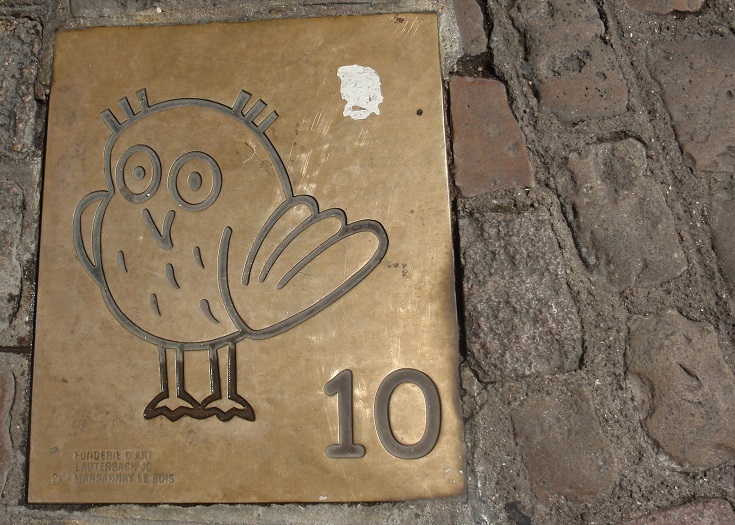 Call into the Tourist Office and pick up a copy of The Owl’s Trail—a handy booklet which includes a self-guided walk covering twenty-two of Dijon’s historic monuments. If you have a little extra time, book a guided tour of nearby wineries towards Beaune and Chablis where some of the best vintages in France are produced. You’ll find more suggestions on what to do in Dijon (including dinner at one of four Michelin-starred restaurants) here. And don’t forget to pick up a pot (or two) of authentic Dijon mustard while you’re in town! As you walk through the towns along the path, you’ll discover fresh food markets overflowing with local produce. Pick up some seasonal fruit and home-made (à la maison) jams and cheese to add to your picnic basket. If, like me, you have more luggage than you want to carry with you during the day, BagTransfert will collect your bags each morning and deliver them to the hotel or Tourist Office of your choice for a very reasonable fee. BagTransfert’s website provides a handy drop-down list of hotels and Tourist Offices to which they will deliver and collect luggage, including Tonnerre, Lèzinnes, Ancy-le-Franc, Chassignelles, Buffon, Montbard, Pouillenay, Flavigny-sur-Ozerain, Pont-Royal, Pouilly-en-Auxois, Vandenesse-en-Auxois, Châteauneuf-en-Auxois, Saint-Sabine, Crugey, Barbirey-sur-Ouche and Dijon. The website also mentions that they will pick up and deliver to all villages in between those mentioned. 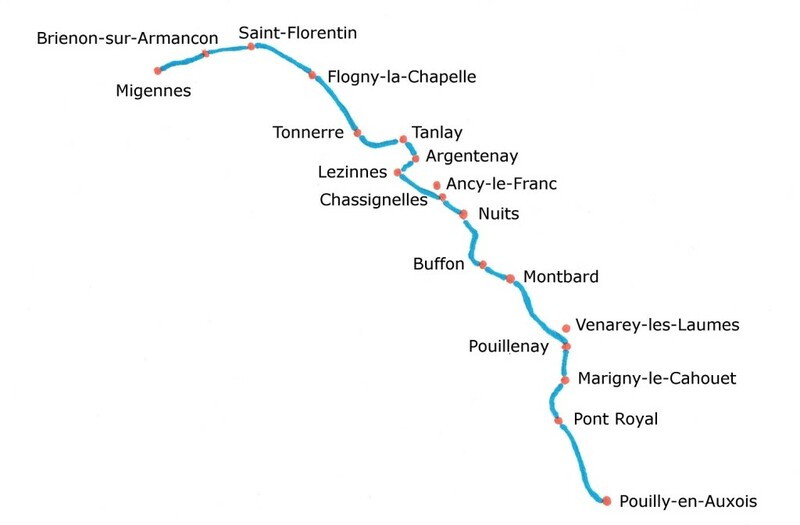 Although Migennes and Saint-Florentin are not included on the list, they are mentioned on the flyer that BagTransfert distributes along the canal. 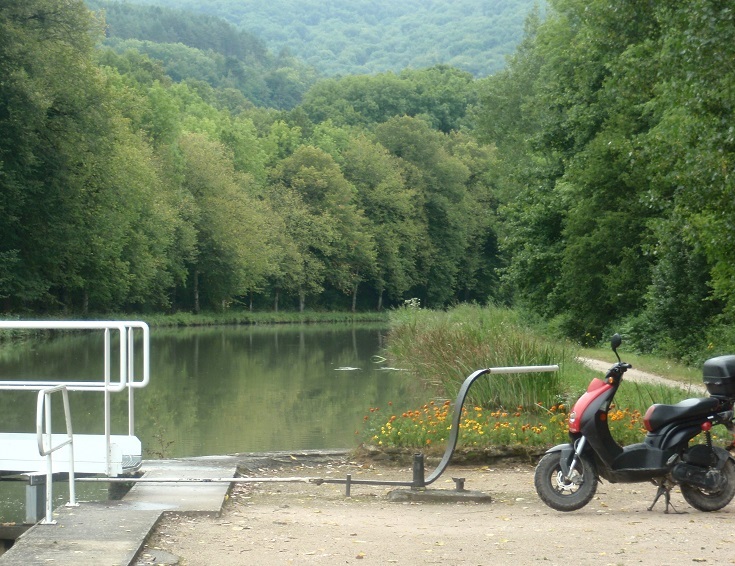 If your time is limited and you prefer to cycle, bikes can be rented from VeliBourgogne at several Tourist Offices along the canal. Bikes can be returned to any of the offices, so cycling some, or all (and there are three sections I recommend cycling), of the stages is very easy to arrange. VeliBourgogne has offices at Migennes, Saint-Florentin, Tonnerre, Ancy-le-Franc, Montbard, Pouilly-en-Auxois and Dijon. Although sunflowers are not prolific along the canal, they are a highlight wherever they appear and so I would do this walk in summertime when they are at their best. The weather is not unbearably hot at that time of year (says an Australian used to tropical summers) and the canal is not a difficult walk. As I’ve already mentioned that it’s possible to cycle part (or all) of this journey, and as it would be a little unfair of me to give advice that hampers you with my balance limitations, I am going to slip into that parallel universe where I can ride a bike as well as anybody. For me, the must-dos on this walk are Château Ancy-le-Franc, l’Abbaye de Fontenay and the ‘most beautiful village’ of Flavigny-sur-Ozerain. However, I have also added a day at Tonnerre, from where I would take the tourist bus to either Château de Maulnes or the ‘most beautiful village’ of Noyers-sur-Surein—or both. Choosing the right day to start the walk is critical or you may find yourself at Ancy-le-Franc on a Monday when the château is closed. The opening days for each monument vary throughout the year, so check these details carefully when planning your schedule. If you leave Migennes on a Saturday, you should find everything open on the days you pass through (except perhaps getting a key to the church in Chassignelles). Day 1 Migennes to Tonnerre (44.4 km/27.8 mi). I would cycle this section and return the bike in Tonnerre. Day 2 Tonnerre. Stay an extra night and visit nearby sites, such as Château de Maulnes and the ‘most beautiful village’ of Noyers-sur-Serein. Day 3 Tonnerre to Lézinnes (18.7 km/11.7 mi). Visit Château de Tanlay along the way. Day 4 Lézinnes to Chassignelles (12.1 km/7.6 mi). Visit Château d’Ancy-le-Franc along the way and the church of Saint-Jean Baptiste in Chassignelles. Day 5 Chassignelles to Montbard (26.7 km/16.7 mi). Day 6 Montbard. Stay an extra night and visit l’Abbaye de Fontenay and the ‘most beautiful village’ of Flavigny-sur-Ozerain. Day 7 Montbard to Pouilly-en-Auxois (52.4 km/32.8 mi). I would cycle this section and return the bike in Pouilly-en-Auxois. Day 8 Pouilly-en-Auxois. If your budget allows, spend the night at nearby Château du Chailly and take a hot air balloon ride over the area. If you are not continuing further along the canal, take an afternoon boat ride through the canal tunnel before catching the bus on to Montbard or Dijon station. 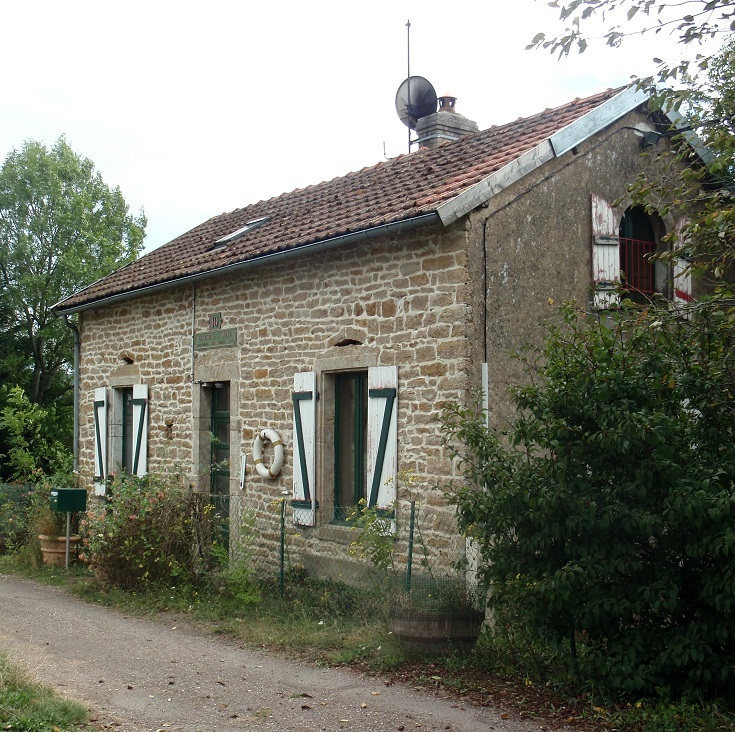 If, like me, you can’t really ride a bike, then the first day’s walking can easily be broken up with an overnight stop at Saint-Florentin and the last day can be broken with a stop at Marigny-le-Cahouët. This section of the Burgundy Canal can be walked very easily in four days—but that would mean rushing past all the delights the canal has to offer. Almost from the start of the walk, you’ll see the fortified château at Châteauneuf-en-Auxois, beckoning you from a far-off hill. Walk past it if you must—but I strongly recommend making the three-kilometre (two-mile) detour and spending your first night soaking up all the history and beauty that this ‘most beautiful village’ has to offer. I love train travel and the often unique view of the countryside that it provides, so a ride on the steam train along the River Ouche—between Pont d’Ouche (on the canal) and Bligny-sur-Ouche—is high on my list when I do this walk. Another highlight of this walk is the Jardins de Barbirey—well worth the short climb from the canal. If I could have extended my trip by another day, I would have loved to experience the cooking class held here in Château de Barbirey. Day 1 Pouilly-en-Auxois to Châteauneuf-en-Auxois (11 km/6.9 mi). Take the cruise one-way through the canal tunnel, get off at Vandenesse-en-Auxois and start the walk here. Day 2 Châteauneuf-en-Auxois to Veuvey-sur-Ouche (12.3 km/7.7 mi). 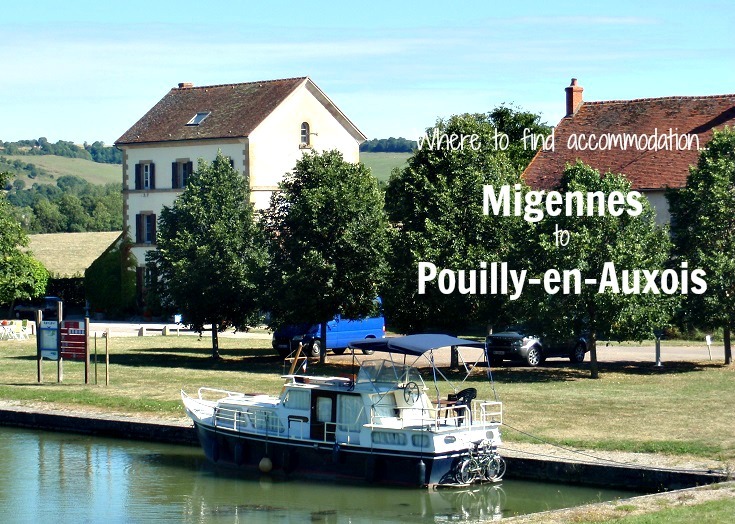 Walk along the canal as far as Pont d’Ouche and take the tourist train ride along the river to Bligny-sur-Ouche. 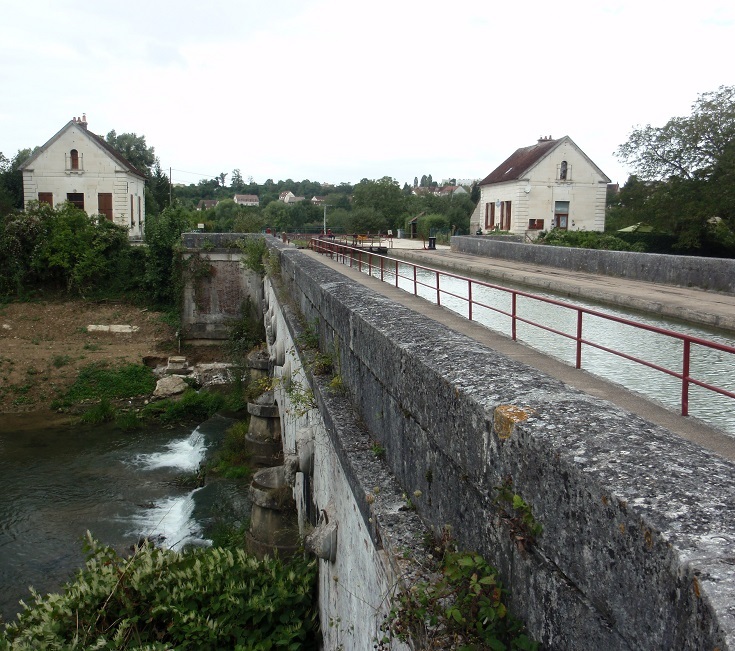 To return to the canal, catch bus 47 back to Pont d’Ouche (or stay on the bus to Veuvey-sur-Ouche, reducing today’s walk by two kilometres/1.3 miles). Day 3 Veuvey-sur-Ouche to Fleurey-sur-Ouche (21.5 km/13.4 mi). Detour off the canal to see the gardens at Barbirey-sur-Ouche. If you need to make up time, buses departing from here stop at most villages along the canal to Dijon. Day 4 Fleurey-sur-Ouche to Dijon (16 km/10 mi). Day 5 Dijon to Saint-Jean-de-Losne (29.2 km/18.3 mi). Rent a bike at the Tourist Office and ride this last section of the canal. After exploring Saint-Jean-de-Losne, take the train back to Dijon to return the bike. You can’t ride a bike either? Walk it then, stay the night in Saint-Jean-de-Losne and take the train back to Dijon the next morning (Auberge de la Marine is a small family-run hotel, located just over the bridge, which also serves seriously good food!). Day 6 Dijon. 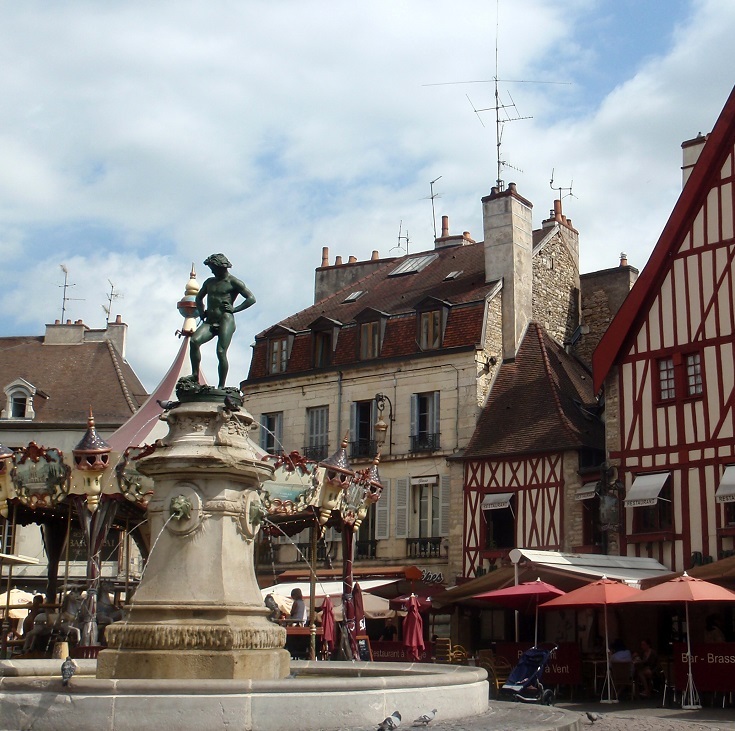 Take a well-earned rest day, or two, to explore Dijon and visit the local wineries. 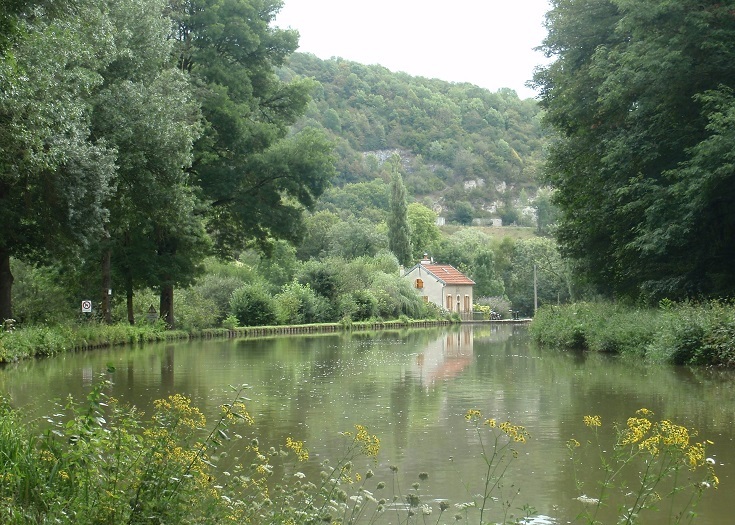 There are plenty of options for overnight accommodation on a long-distance walk along the Burgundy Canal, most of them located on, or very close to, the canal towpath. 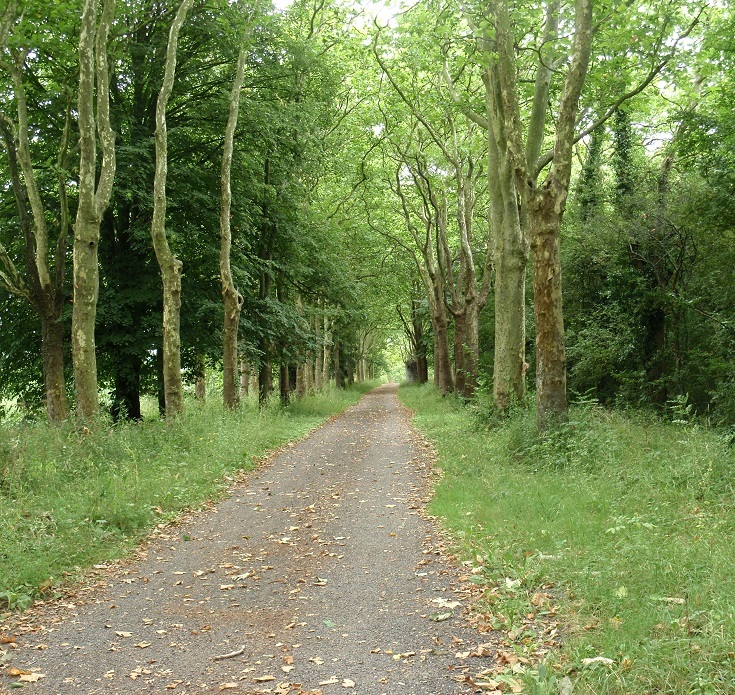 The longest section, from Chassignelles to Buffon, requires a walk of 19.5 kilometres (12.2 miles), but as is the case all along the canal, the walking is flat and easy. 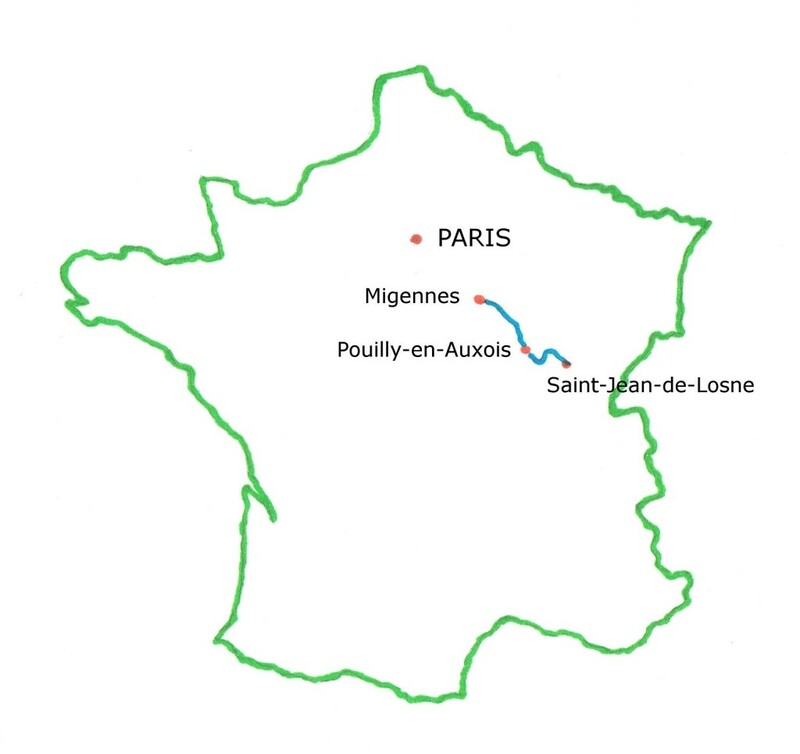 Between Migennes and Pouilly-en-Auxois, accommodation is available in the following towns, with distances given from the starting point of Migennes. 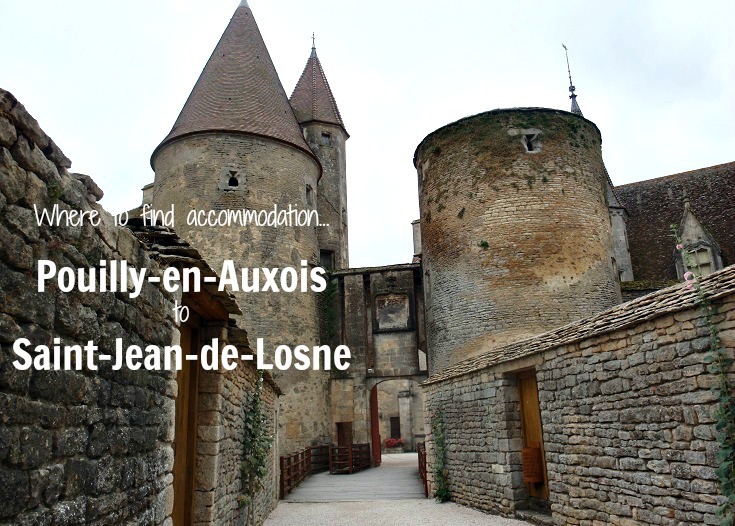 Between Pouilly-en-Auxois and Saint-Jean-de-Losne, accommodation is available in the following towns, with distances given from the starting point of Pouilly-en-Auxois. Where is it in France? 87 pages packed with dozens of photos, taxi phone numbers, links to accommodation websites and train and bus schedules, Tourist Offices, market days, where to find a pharmacy or an ATM, useful French phrases—and many more practical tips! 81 pages packed with dozens of photos, taxi phone numbers, links to accommodation websites and train and bus schedules, Tourist Offices, market days, where to find a pharmacy or an ATM, useful French phrases—and many more practical tips! This website contains NO sponsored posts or affiliate links. If I recommend a product, service or somewhere to stay, it’s because I’ve been there, used it, loved it—and I think you will too! Are you dreaming of a walk through the picturesque villages and glorious countryside of rural France and don’t know where to start? Your details stay here – no walking ever! Your details stay here - no walking EVER! It's a promise!